The Platinum Gourami shares the durability of the all varieties of Three-spot Gourmi but has an extra delicateness in its appearance! The Platinum Gourami is a beautiful color-morph of the Three Spot Gourami Trichopodus trichopterus (previously Trichogaster trichopterus). It is one of the more subtle color varieties with its white body having soft yellow or silver undertones and a deeper toned striped patterning along the back. There is still a hint of marbling visible on this species, but it lacks the two dark spots seen on its parentage. This pretty fish, sometimes called the Silver Gourami, will make a gorgeous addition to a community aquarium. This gourami has been developed in captivity for the aquarium trade, first appearing in 1970. Breeders selectively paired individuals for their desired coloration and strengthened it over several generations. A gold color form called the Gold Gourami also appeared in 1970. Other mutations include a silver blue variety with darker blue markings that was developed from the Blue Gourami. It is known as the Cosby Gourami, named after the American breeder that developed it. The Cosby Gourami was further developed into the Opaline Gourami or Marbled Gourami.The majority of these varieties are commercially bred in the Far East and Eastern Europe. These are Labyrinth fish, also called Anabantoids, which are distinguished by having a "labyrinth organ". This is a respiratory organ that allows them to get air at the surface of the water. Like other fish they have the ability to pass water through their gills to obtain oxygen, but they are also able to breathe atmospheric oxygen. Another characteristic of the labyrinth fish is that of being a bubble nest builders. The male will build a bubble nest at the surface of the water and once the female lays the eggs, he will place them in his nest and guard them until they hatch. These fish are very similar to their predecessors in all aspects other than coloring. They are the same in size and have the same habitat and care requirements. These are some some of the hardiest aquarium fish and make an excellent choice for new fish keepers. Aquarists will rarely forget the gouramis they have kept because each one has a remarkably individual personality. Platinum Gouramis are long lived and seem to be quite aware of their owners. These beautiful fish also have the endearing habit of using their pelvic fins to feel their environment and even feel their tank mates. Because this is a man made strain, inbreeding is common in the genetic history of these gouramis. It is therefore in the aquarist’s best interest to take extra care when choosing specimens. Sulking or resting on the bottom is never a good sign. Look for a well formed fish, free of skeletal or other deformity, and without obvious injury. If possible inquire as to the origins of the specimens to ensure that reliable breeding practices were used. The Platinum Gouramis, like all the variants of this species, are generally considered a good community fish when small. But when they get large they are often not as peaceful as the other gouramis. They have been known to attack smaller fish and males can become belligerent or territorial. The best tankmates are other fish that are of similar size and temperament. These fish can reach a length of up to 6 inches (15 cm), but about 5 Inches (13 cm) is a very good length for it to attain in the aquarium. As juveniles they can be kept in a 15 - 20 gallon aquarium but they will soon outgrow a tank this small. As adults at least a 35 gallon tank or larger will be needed. Because of their varying temperaments, the tank should be decorated in a way which allows both the dominant and quieter personality type fish to live happily. Densely planted areas will help create some hiding places and they will also appreciate the cover of floating plants for some shadowy areas. The Three Spot Gourami Trichopodus trichopterus (previously Trichogaster trichopterus) was described by Pallas in 1770 and is found widespread throughout continental southeast Asia and Indonesia. 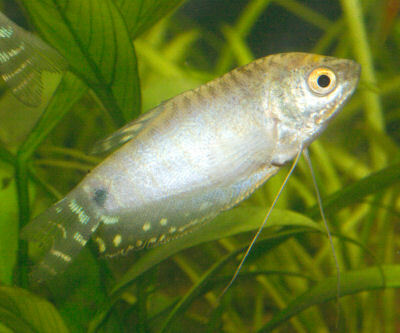 The Platinum Gourami is a man made variant of the Three Spot Gourami. It first appeared in the aquarium industry in 1970. Another common name it is known by is the Silver Gourami. The majority of the available specimens are commercially bred in the Far East and Eastern Europe. In nature the Three Spot Gouramis occur in lowland wetlands. They are found in marshes, swamps to peatlands, as well as flowing streams and canals. They inhabit shallow waters that are sluggish or standing still, but with a lot of aquatic vegetation. They are omnivorous in nature and feed on crustaceans, insect larvae, and zooplankton. The Platinum Gourami is somewhat compressed laterally and roughly follows the diamond shape of the other gouramis but is more elongated. The fins are rounded and relatively large. It has long flowing ventral fins that are threadlike and extremely perceptive as they carry touch-sensitive cells. It also has a labyrinth organ, a respiratory organ which allows it to absorb atmospheric oxygen directly into its bloodstream. It can reach about 6 inches (15 cm) in length, but about 5 Inches (13 cm) is a very good length for this fish in the aquarium. They will be able to breed at about 3 inches (7.5 cm). They have an average lifespan of 4 to 6 years, but can live longer with good care. The body color is white with a soft yellow or silver undertone and thus it is also refer to as the Silver Gourami. A hint of marbling is still visible on this species, especially on the back and belly. These spots and stripes extend on to the fins, giving the otherwise clear fins a very attractive pattern. A pale remnant of the two dark spots for which this species group is known is often still visible. Size of fish - inches: 5.9 inches (15.01 cm) - hey can reach almost 6" (15 cm), but are usually about 5 Inches (13 cm) in the aquarium. They will breed at about 3" (7.5 cm). Lifespan: 4 years - The average lifespan is 4 - 6 years, but with proper care they can live longer. The Platinum Gouramis are omnivorous, in the wild they feed on on crustaceans, insect larvae, and zooplankton. In the aquarium these fish will generally eat all kinds of live, fresh, and flake foods. To keep a good balance give them a quality flake or pellet food as the base to the diet. Supplementation should include white worms, blood worms, brine shrimp, or any other suitable substitute. Fresh vegetables can be offered as well, blanched lettuce being a good option for many aquarists. Generally feed once or twice a day. An interesting characteristic of the Three-spot gourami varieties (as well as the Pearl Gourami), is that they are well known for eating hydra. The hydra is a tiny pest that has tentacles with a venom. They will capture very small fish and paralyze them with the venom and then hold them fast with the tentacles until eaten. If you have a hydra problem in your aquarium, here is your solution. The Platinum Gourami will swim in all parts of the tank. When young they can easily housed in a 15 - 20 gallon aquarium, but adults will need at least 35 gallons or more. It is desirable to keep the tank in a room with a temperature as close as possible to the tank water to prevent damaging the labyrinth organ.The tank should have an efficient filtration system but should not to create too much of a current. This fish will be bothered by a strong current in the tank, especially if the tank is small. Air stones can help provide well oxygenated water. Minimum Tank Size: 35 gal (132 L) - Juveniles can be kept in a a 15 - 20 gallon aquarium, but adults need more space. Temperature: 73.0 to 82.0° F (22.8 to 27.8° C) - Keep the surrounding room temperature consistent with the water temperature to avoid causing trauma to the labyrinth organ. Breeding Temperature: 80.0° F - They will breed with temperatures raised to about 80° F (26° C). The Platinum Gouramis are generally considered good community fish when small, but they are not as peaceful as the other gouramis. They have been known to attack smaller fish. When they get older only keep them with fish their own size. Individuals will show varying degrees of aggression. Some will be very belligerent and will handle their tank mates quite roughly. Others will be peaceful to the point of shyness. The aquarist should be prepared to adapt their tank to suit all personality types. A mix of neutral personalities is an ideal goal for the range of tank mates. You should not include fish which will provoke this species into aggression as they are often passionate fighters. Fin nippers and gouramis should absolutely never be mixed. The trailing pelvic fins and generally slower movement of this gourami make it the perfect victim for nippers. The Platinum Gourami is also a skilled hunter and extremely small fish or fish fry rarely last long. Good tankmates for this fish are robust cyprinid species like barbs, but avoid those that are notorious fin nippers like Tiger Barbs and Clown Barbs. 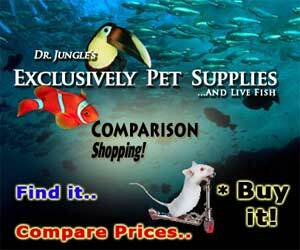 Other good selections include larger characins, loricariid catfish from South America, and loaches. They can be kept with other medium to large gouramis, but bullying between gouramis is a likely scenario. Bullying between gouramis is a likely scenario as these fish, typical of the family, are fixated on constantly working out the details of the hierarchy. Temperament: Peaceful - This species may be rough with smaller tankmates, increasingly so as it ages. This fish is a skilled hunter so smaller tankmates will probably be consumed. Same species - conspecifics: Yes - Can be kept singly, in pairs, or groups. If kept in a group make sure there are plenty of hiding places to keep one or more of the individuals from being bullied. The male Platinum Gourami has a longer and more pointed dorsal fin while the female's is shorter and rounded. Like most Labyrinth fish, the Platinum Gouramis are bubble nest builders. Breeding is fairly easy and providing a breeding tank that is to their liking is perhaps the biggest challenge. A pair will be most likely to spawn if there is a fair amount of plants, a good sized surface area, and the temperature is to their liking. Prior to spawning they should be well conditioned with small offerings of live and frozen foods several times a day. When well fed, females should begin filling out with eggs, appearing very plump. An individual breeding tank of 10 to 20 gallons or more should be set up. A shallow water level is not as critical for this fish as it is for other Labyrinth fish species, but it can be kept at about 5 - 6" (13 - 15 cm). Normal water parameters are fine but raise the temperature to about 80° F (26° C). You can add a small gently air-powered sponge filter or some peat filtration, but the tank current should be minimal. Many aquarists find that floating plants, or stem plants grown to the surface, or any other floating debris will help keep the bubble nest in place. A healthy pair of adults should be introduced into the breeding tank. The male will spend a lot of time building a large bubble nest, usually in a corner. Once the nest had been built the male will begin a courtship display to entice the female to spawn. He will swim back and forth, flaring his fins and raising his tail until the female allows him to wrap his body around hers and the two will spawn. Their eggs as well as the fry, are lighter than water and float to the top and be deposited in the nest. If the female was well filled out the spawn can be huge, between 700 to 800 eggs. The female must be removed after the eggs are produced or she risks being killed by the male. The male will tend the nest and guard the eggs until they hatch. After hatching the fry will soon emerge from the nest and become free swimming. This is when the male should be removed or he might eat the fry which emerge from the nest. Free swimming fry can be fed infusoria or a liquid fry food until they are large enough to eat baby brine shrimp. See the description of breeding techniques in: Breeding Freshwater Fish: Anabantoids. Also see Fish Food for Fry for information about types of foods for raising the young. Platinum Gouramis are very hardy so disease is not usually a problem in a well maintained aquarium. Some diseases they are prone to are bacterial infections, constipation and Hole in the Head if good water quality, nutrition, and maintenance is not provided. With any additions to a tank such as new fish, plants, substrates, and decorations there is a risk of introducing disease. It's advisable to properly clean or quarantine anything that you want add to an established tank prior to introduction, so as not to upset the balance. The Platinum Gourami is usually available both in stores and online and is moderately priced, but it is not as widely available as the other color variations of this species. MY female platinum Gourami keeps picking on my male golden Gourami. I don't know what to do to stop this, help? Gouramis are very territorial, and will often fight with each other. This is especially true when you have only two. Three work much better, so try adding a third. Also provide many hiding places with plants that reach up to the surface, so they aren't always in each others faces. Some folks even suggest water changes and mixing up the food you offer, but I'm not familiar with whether these will work or not. Hi, I am having a pair of platinum gourami. In those two, in recent days I found the male is not in normal mode. He is always staying in the bottom like a sunken ship. I also found red spots across his body. What is that? Any medical help? Could be bacterial or parasite infection. Check ammonia nitrates and nitrite levels. I am having two platinum gaurami. (male and female). Both are very healthy and male is very large and ruling the whole tank. One day in morning i found the male moving forth and back(its like dancing). And also i found some bubbles(not more) on the top of the tank. But the male is not near to it. (bubbles is in one corner and the fish is in another corner). I taught its ready for breeding. Then i decided if i kept this two fish in tank, other tank mates will eat the eggs. So before spawning i removed the two gaurami from the tank and kept in cemented tank in our garden around 30cm depth and water is around 12cm depth. But later i understand the nest is already built by male. I think I had done a worng thing. Will the male again built the nest for to spawn or how long it may take to built the next nest? Not sure how long it will take to build another nest, but if it is in spawning condition it will. If they are healthy and content, they will actively build bubble nests. Thank you mam for your reply. Nowadays they (both male and female) resting on bottom for most of their time. Only they coming to top of tank for to take oxygen and food. But they are very active while eating thier food. They are around 3 inches and 5 inches long. Is it s a good sign. I even cleaned my tank. But same result.